In the American Le Mans Series, Flying Lizard Motorsport (current title defenders) clinched their first podium result of the season at their third attempt. With the Porsche 911 GT3 RSR fielded by Flying Lizard Motorsports, Porsche factory pilots Joerg Bergmeister (Germany) and Patrick Long (USA) finished second in the GT class at the Northeast Grand Prix in Lime Rock to improve their championship position. The race on the short 2.478 kilometer circuit in Connecticut was thrilling from start to finish. And it began well for Porsche: Patrick Long snatched second place right at the start and defended his position to the first pit stop and driver change. His teammate Joerg Bergmeister, who tops the winners’ list with five victories from the last five years on this circuit, fell back just once to third place after another pit stop behind his works driver colleague Wolf Henzler, but was quickly able to regain his position. At times Joerg was only two seconds adrift of the front-runner. But with three laps to go, his result looked in jeopardy when tire damage forced him into the pits. As always, the Flying Lizard crew worked swiftly on his number 45 Porsche so that he was able to defend his second place. At the finish only 20.387 seconds separated Bergmeister and Long from their first win of the season. 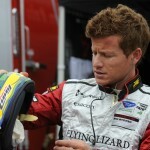 Patrick Long said: “I’m very satisfied. Today we have earned plenty of championship points. Because all of our direct competitors had problems, these points are especially valuable. Our car was perfectly set-up over the entire weekend. It’s a shame that we were just a few seconds off clinching victory." Bryan Sellers drove the first stint for the Falken Tire squad. Cleverly, he kept out of any trouble on the tight circuit, and his teammate Wolf Henzler did the rest. With an early refueling pit stop 1:15 hours before the flag, they took their opponents by surprise and turned up in second place when the rest of the field pitted for fuel. Wolf Henzler too had his big moments: 30 minutes before the finish he brought the Porsche 911 GT3 RSR into the pits with suspected tire damage. Luckily, he had only picked up rubber from the track. And in the final laps, problems with the fuel pressure cost him a safe third place. He took the flag in fifth. In the second Flying Lizard Motorsports-run Porsche 911 GT3 RSR, works driver Marc Holzer (Germany) clinched seventh at his Lime Rock premiere together with American Seth Neiman. He was clearly pleased with this result. 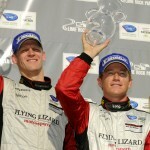 Sascha Maassen (Germany) and Bryce Miller (USA) brought the Paul Miller Racing Porsche 911 GT3 RSR home in sixth place. Victory in the GTC class went to Americans Dion von Moltke and Mike Pierce with a Porsche 911 GT3 Cup. The pictures below can be more easily viewed on our web-site using the lightbox viewer. 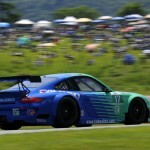 Simply click on Pictures and Results of Porsche's Performance in the ALMS at Lime Rock and you can view them directly. Round 4 of the American Le Mans Series is held on 24th July in Mosport/Canada.